A mini twitter-storm ensued as people highlighted the obvious flaws in her argument and quite rightly criticised the article for being deeply misleading. Frankly I think I could just leave this as it stands and trust the intelligence of readers of this blog to see how nonsensical Joan's riposte is. "no tax raised from these sales goes to Scotland, also factually accurate"
I'm not sure quite where Joan thinks the money to fund Scotland's public services comes from. As the Scottish Government's own GERS figures show - the one's which apportion corporation and employment taxes to Scotland as they assume they'd fall were we separate - we in fact receive far more in spending than we contribute in taxes (that's the definition of running a deficit). More than that though: we receive proportionately more in spending than we generate in taxes (which is why we have a £8bn deficit gap). That deficit gap is after assuming "tax raised from these sales goes to Scotland". Joan may not like the concept of pooling and sharing, but surely she should at least make an effort to understand it. "duty ... which raises substantial revenue for the London Treasury"
The London Treasury - which then redistributes these taxes throughout the UK by way of public spending, in the process ensuring that we get our fair share back. 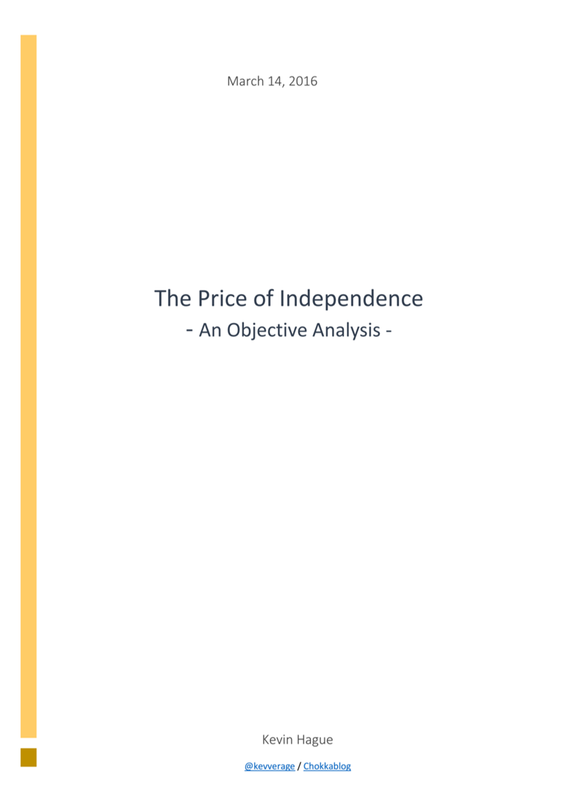 Again: Duty is a consumption tax so - quite correctly - only the Duty raised on whisky (or wine or vodka or cigarettes) sold in Scotland is attributed to Scotland in the GERS analysis that we all use. "corporation taxes - none of which is paid in Scotland"
Technically true - all corporation taxes are paid to HMRC and then we get them (and a lot more) back by way of public spending as the Scottish Government's own GERS figures conclusively show. "the exported whisky will also raise duty and sales taxes in those countries where it's sold." "to suggest the £4bn doesn't generate any tax is absurd"
Indeed it would be if anybody was suggesting that; nobody is. "we can say with 100% accuracy that it generates nothing in Scotland"
Huh? Does Joan really think that those whisky companies employing people and spending money in Scotland are "generating nothing in Scotland"? And of course - at the risk of labouring the point which unfortunately does seem to need labouring - the corporation taxes they pay are attributed to Scotland in the GERS figures that everybody uses. "most readers will struggle to understand"
A statement made more in hope than expectation I think - she knows she only wins if people don't understand what's actually going on. 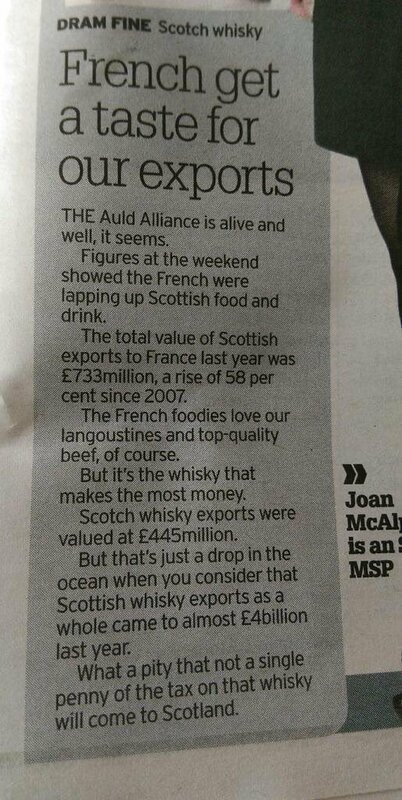 "revenues from our most successful export go everywhere except Scotland"
A truly remarkable note to finish on. Surely by now everybody understands that these revenues go into the UK tax pool from where they are shared back out as public spending. The Scottish Government's own GERS figures very clearly shows that not only do we get some of that revenue back, in the last few years - and given oil decline, for the foreseeable future - we get a larger share from that pool than we contribute. That's the beauty of pooling and sharing. I do hope the majority of right-thinking Daily Record readers can see through Ms McAlpine's rather clumsy attempt to stoke misguided resentment. The Record has gone up in my estimation in this episode; this is precisely the sort of forum in which these discussions need to happen, and well done to them for publishing Kevin's contribution. Even the most biased reader would surely pick up on the incoherence of the McAlpine argument, and hopefully seeds of doubt will be planted. "She knows she only wins if people don't understand what's actually going on." How true. Absolutely brilliant work Kevin to expose the woman's stupidity. Just another example of the cognitive dissonance that seems to afflict a number of independence supporters. In the event Scotland had voted Yes, these people would be hit hard by reality - and it wouldn't be pretty. I find it interesting that 'concerned constituents' of Alistair Carmichael (but definitely not SNP supporters...) are currently throwing money at a court case over lies he has supposedly told and yet there are no concerned constituents around to take McAlpine to task for her blatant lies in that article, and her response. As I posted on Fraser Whyte's blog, you need to publicly challenge her to answer one question "Do you accept your own government’s figures, that Scotland received £12 Billion more in spending than we contributed in revenue in 2013/14?" Hi Kevin. It seems to me that McAlpine is not simply expressing an opinion - for which she is allowed to make a mistake without real fault accruing - but has gone a step further and is presenting as facts, non-facts. Is there no regulatory mechanism to rectify this? Don't newspapers have an obligation to check facts before publishing, etc? Kevin. I think your comments regarding Joan McAlpine's response are correct. However, may I try to offer a single observation that explains everything? She views Scotland as the same thing as the SNP.